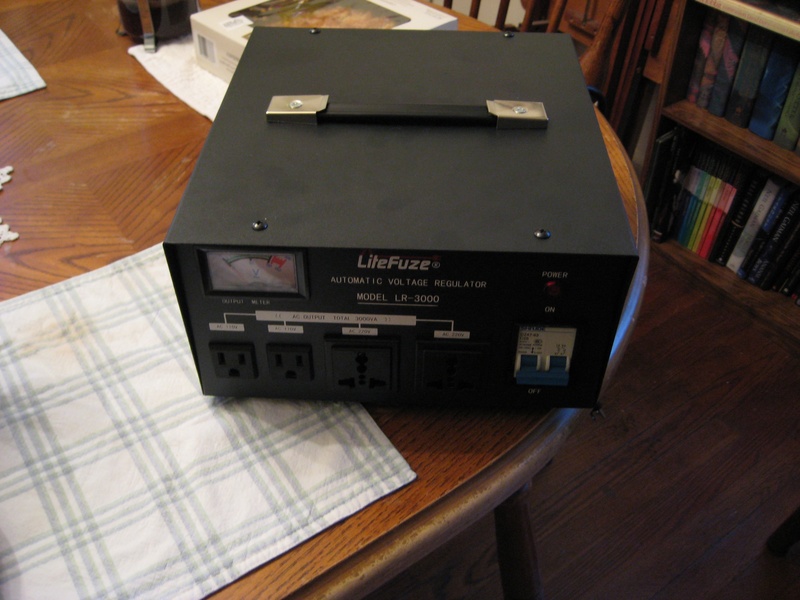 If either of my regular readers have any electrical expertise, then I’d appreciate your input. Let me say up front that this is not by any means the most practical thing I’ve ever done, so if you want to tell me that, you haven’t told me anything I didn’t already know. 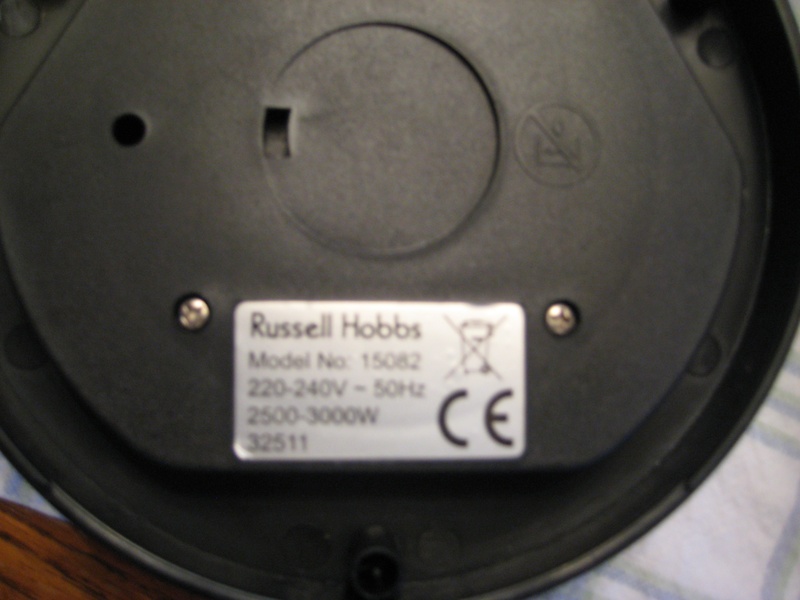 So, for a number of reasons, I thought it would be cool to get a particular model Russell Hobbs teakettle. You will perhaps notice already what my issue is. Yep, it’s a UK plug. Now, this was hardly an “Aha! 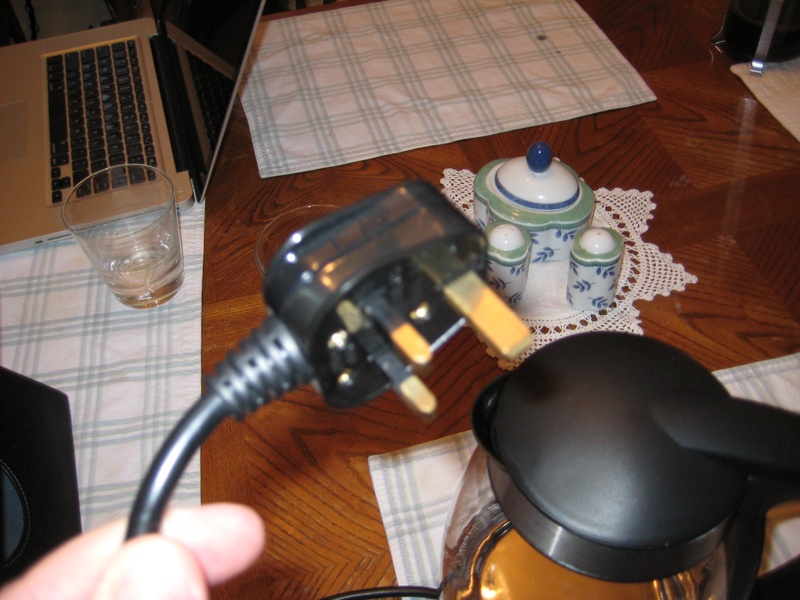 Fooled you!” moment; I knew it had a UK plug when I bought it, and I ordered it off of Amazon UK. I knew exactly what I was ordering when I ordered it. 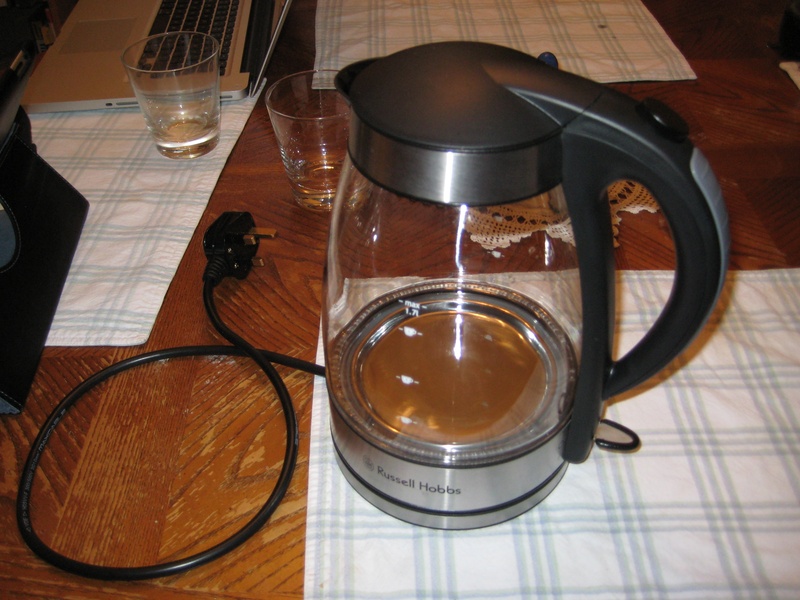 I just figured, “Hey, there’s gotta be a workaround.” It seemed worth it; I was told that UK kettles are nice because they heat up near-instantly, and they’re great if you can get them working. There seemed to be some folks online who had done it, so there seemed to be precedent for my impracticality. So, I took the element to a local electrics shop. “What do I need to make this run?” I asked. So, fine. I got exactly that. (Forgive the Darth Vader breathing; I’ve been sick for the last two weeks.) As you can see, it works for a bit (aren’t the shiny blue lights awesome! ), then the transformer’s circuit breaker trips. After a few seconds, I can reset the circuit breaker, the kettle goes again, the breaker trips, reset, kettle goes again, breaker trip, reset, kettle finishes boiling and shuts itself off. It still all happens in less time than it would take to boil the water on the stove, but I can’t really say that it’s exactly what I had in mind. So, short of moving to the UK, what can I do to get this to work?